Boyd is currently an eighth grader at John Jay Middle School in Cross River, New York. 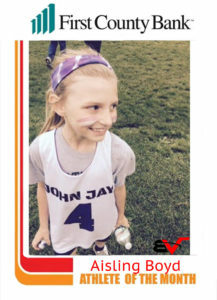 She plays midfield for her town team and additionally plays for the 2024 Gold Coast Club Team. Boyd’s commitments do not end on the lacrosse field though. She is an honors student who also is a competitive horseback rider. She also is an avid surfer in the summertime whenever the opportunity is there. Boyd is also a devout Mets’ fan, which helps prove how committed and patient she is to the process of getting better over time. We want to congratulate Aisling again on receiving this honor, we are proud to call her part of the BVSA family! We look forward and so does Nazz to having her back sharpening her skills with CT City Lax this upcoming fall. Good luck with your upcoming season and go out there and dominate! Our February Athlete of the Month is 15 year old Mackenzie Bruggeman. Kenzie is one of B.V.S.A.’s most impressive athletes. What she is able to do on the softball field is typically unmatched and hard not to notice. Bruggeman has not been able to achieve these distinctions without putting in the time to make it second nature. During this time at the academy, it is often a great show she is able to put on, with so many stopping what they are doing to watch. Even when you cannot watch her, you can tell it is her working from the different sound her ball of the bat or her ball popping the glove makes. Bruggeman is a powerful player with a fire to compete and help her team with whatever way she can. 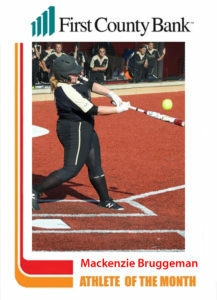 Kenzie is currently a sophomore at Trumbull High School and is preparing for her second season of Varsity softball in the coming months. Bruggeman who is mainly a shortstop, can also play third, and played a lot of second base for Trumbull last season. All leading up to her pitching every state playoff game for Trumbull to end their season. Once the High School season ends Bruggeman is back with her long time summer team the Lady Titans. 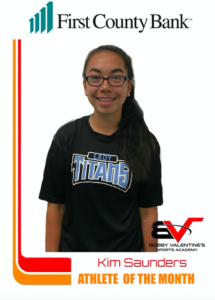 Lady Titans is B.V.S.A.’s softball travel program coached by Danielle Simoneau. Last summer for the Lady Titans Kenzie put up some astronomical numbers; Batting .402, OBP .467, Slugging .630, making for an OPS of 1.098. She had 37 hits including 10 doubles, 1 triple and three home runs all while driving in 36 runs. On the bump she was 6-1, with a ERA of 2.88, and had 38 strikeouts. These numbers help reinforce why she is such a feared player on both sides of the ball. Bruggeman works at B.V.S.A. as a junior instructor for softball programming and clinics that happen throughout the year. She is also an athlete that puts in the hours with Overdrive Elite Performance multiple times a week and excels there like few others do. Bruggeman just now getting into the recruiting process has been turning heads and is expected to receive a ton of attention moving forward. No one in this area understands that more than her mom, and coach, Danielle Simoneau. Danielle was also highly touted and went through similar circumstances. Danielle went to University Hartford on a full ride, was a fear pitcher and hitter while there, still holding school records for a multitude of statistics. Kenzie is a hard working student who understands that she is a student-athlete. But we are looking forward to seeing her continue to grow as an athlete and an individual. Roger Bolton has been selected as our First County Bank Athlete of the Month for January. Roger is an extraordinary husband, father, worker, and overall person. He is happily married to his wife, Lynne, and they have three amazing children, Taylor, Tim, and John. Roger makes it a priority in his life to train year-round at Bobby Valentine’s Sports Academy, while working full time as the President of the Arthur W. Page Society. In January of 2019, Roger attended his ninth fantasy baseball camp, and seventh in the last seven years (all with the Cincinnati Reds). Fantasy Camp is a six-day event where the participants play at least 10 games, including one against ex-pro Reds’ alumni. The entire week is also programmed, led, and coached by former Reds players. In order to prepare for this, he trains at BVSA with Anthony Conte. Since 2012, Roger has put in over 150 hours of work, always working to improve for the next camp. His sons, Tim and John, also trained at BVSA throughout their high school varsity baseball years. Additionally, his daughter Taylor, who captained her high school varsity softball team, recently started to train with Roger and plans to join him at Reds’ camp next year. As President of Page, Roger is part of a global membership organization for corporate chief communication officers and PR agency CEOs. Their members help their enterprises build brand and reputation, earn trust by developing a strong corporate character and authentically engaging with key stakeholders. He has prior experience in corporate communications at Aetna and IBM, and in government public affairs at the White House, U.S. Treasury, Office of the U.S. Trade Representative and U.S. Congress. Roger was recently granted the Alexander Hamilton Medal for Lifetime Achievement in 2018. Watch with the link below. We look forward to having Roger continue to come back for many years to come and to see his success on the field and in life keep on such an outstanding trajectory. BVSA is proud to have Roger as our oldest private lesson client and a member of the family. Our December Athlete of the Month is 18 year old Joey Skarad. Skarad has not just been dedicated to being an excellent baseball player since he could hold a bat, but also a dedicated member of the baseball community at B.V.S.A. Without so much as a second thought, there are few names that you can say out work Skarad in the cages, gym or even at work. He is a fierce competitor, with an unmatched drive, and internal motivation to out work what he did yesterday. Skarad played at Westhill through his junior year and transferred to King. Now a senior, he is a captain and has been accepted, with a roster spot to Sacred Heart University. 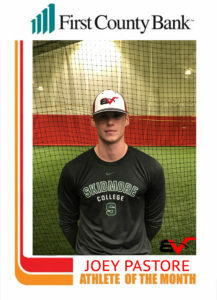 Skarad finished with both the recruiting process and his acceptance into SHU is able to focus on enjoying the rest of his senior year and crushing baseballs come the high school season. He has chosen to study economics, while continuing to chase his passion of baseball. Skarad is a New York Yankees fan and Dallas Cowboys fan. He also grew up having Derek Jeter as his favorite player and role model on the field. Skarad is a facility favorite and all here look forward to seeing what his future holds for him both on and off the field. Our November Athlete of the Month is 17 year old Leo Socci. Leo has been a dedicated baseball player since he was a little kid and although he has gone through a tough injury, he still pushes through and works hard. He is an easy-going, cool, calm and collected kid that has an ongoing motor filled with passion for the game. Leo as a freshman and sophomore went to West Hill High School and was on their varsity baseball team. At West Hill he was give Honorable Mention for two years in a row and now has transferred to Brunswick High School as a junior. The “adversity” Abate is referring to is his Tommy John surgery he had last year in 2017. Tommy John surgery is a popular one for baseball players, pitchers especially in which your collateral ligament tears in your elbow. Leo’s recovery time was 14 months total going to therapy twice a week for the first nine months. Leo is currently in the recruiting process hoping that one day he will get to play college baseball. For a potential area of study, Leo is interested in criminal justice. His favorite baseball team is the New York Yankees and favorite football team the New York Giants. He looks up to Marcus Stroman a pitcher for the the Blue Jays. Leo has a long list of supporters with him on his journey and we all hope the best for him. Sunday, October 14, 2018 marked the end of an era for the BVSA Fury program. One of it’s greatest players played his last game wearing the #5 Fury uniform. 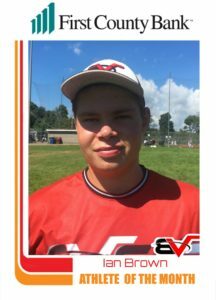 Kevin Bruggeman has been playing Fury baseball since 2013 when he was 12 years old. The first time I saw him play, the year before, for an another organization, I new he was a player and a gamer. Fortunately for us, he came to Fury the following year and I had the opportunity and great fortune to be his coach for his first few years. Kevin exemplifies everything you want a player to be. He plays with passion, energy and a level above most around him. He plays with grit and determination and is looked up to by his teammates and opponents. He works at his craft like no other and it shows on the field. His efforts and production helped lead our team to multiple tournament championships and tremendous experiences for all of us. It seemed like whenever we needed a big hit or a big play, Kev delivered. He has a great appreciation for the game and although an intense competitor, there’s always a smile and a joy for the game. Kevin’s primary position is catcher and he controls the game behind the dish the way great catchers do. Even at 12 he had a great feel for the game and always called his own pitches very effectively. At SS or 3B (or wherever for that matter) he fortifies the defense effortlessly and with great consistency. Just about every game I ever coached while Kevin was playing, either an umpire, the opposing coach or even opposing players would make positive comments about #5 after the game. It was very easy for most to see that Kev was special. His tremendous work effort carries over to the classroom where Kevin has earned excellent grades. His combination of talents has earned him a scholarship to play at Hofstra University where Kevin will be headed next fall. 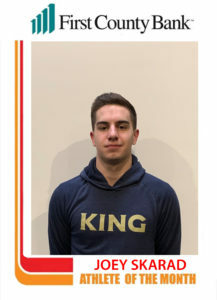 On behalf of all of your coaches, teammates and the BVSA/Fury family, I would like to extend our sincere thanks to Kevin for putting on the Fury uniform for all these years and setting the standard for all Fury players. It was a great pleasure for me to be your coach but there is just one thing. I asked you countless times to take the mound and throw an inning or two and you never did. Someday, somewhere, your going to have to put on the #5 uniform one more time and throw a few pitches for me. I’m sure it will be a 1,2 3 inning. Joe Pastore is our October Athlete of the Month. He is a 17 year old senior, at Ridgefield High School. Joe is a 2 year varsity starter on the baseball team. In his junior season at Ridgefield his hitting average was .308 and he hit 2 home runs. Over the summer he played with Baseball U and ended with a hitting average of .382, 24 hits, 16 xbh, and 3 home runs. Joe has been training with B.V.S.A for over 6 years now. He has worked with many coaches at B.V.S.A and anyone who you ask will say he is a very easy-going and hard working kid. Joe is a power hitter and very efficient from the field. He enjoys playing center field the most. He first started training with Sully from 2012-2015 and from then on trains with Anthony Conte. He is dedicated to being the best player he can be and is passionate about the game. He recently committed to Skidmore College to play baseball and being that his favorite school subject is economics he wants to study in the business school there as well. He started playing when he was 4 years old and is the first in his family to play baseball. He chose Skidmore because of the academics and the location being in the North East. His favorite MLB team is the New York Mets and favorite player is George Springer. Excited to announce that Ian Brown, a.k.a “Big Country” is our Athlete of the Month for September. 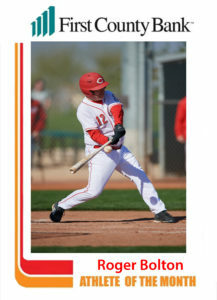 Ian is a 16 year old at Greens Farms Academy and plays as a first basemen on their varsity baseball team. Ian is a dedicated, hard-working, kind, witty and loyal kid on and off the field. 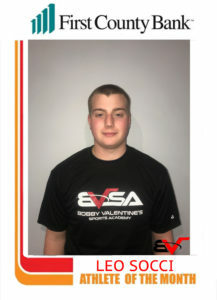 He started playing baseball in 2008 first with Darien Little League and then started playing with Bobby Valentine’s Sports Academy’s, Fury baseball team. In 2015 Ian played with Darien New Canaan American Legion baseball. He currently is still a member of the BVSA Fury. Ian has had some great accomplishments and awards throughout his baseball career. He was on the GFA Dragonoids Robotics Team, he won the national championships in 2017 and Inspire Award and won regional championships in 2018. Ian was also on the baseball Factory/Under Armour National Team. At Green Farms Academy, Ian was the Head of School Honor Roll 2018. Ian would love to play college baseball one day and study either science and technology or finance. His favorite subject in school is STEM. Outside of baseball he loves to go whitewater kayaking, fishing and spending time with his Portuguese Water dog, Vasco. His favorite baseball team is the New York Yankees and is a big fan of Aaron Judge and Giancarlo Stanton. Ian loves football as well and roots for the Pittsburgh Steelers, and his favorite player Ben Roesthlisberger. Seventeen years ago today, a very quiet morning turned dark as the tragic news spread. At 8:46am the North Tower was hit and just seventeen minutes later the second tower was struck sending a mixture of emotions through every American’s being. Before an hour had passed since the first impact the Pentagon was hit and the fourth plane crashed into an open field. The horrific event now over, a feeling of sorrow sweeping the nation, and it was now time to start the restoration of a city brought to the brink of darkness. 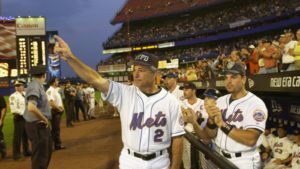 Bobby Valentine, the then Mets’ manager expressed the same sentiment that many felt that day. “Fear, I think, was the first emotion, and sadness, and then a couple days later I think that anger started coming out. But the bus ride was surreal. That’s the easiest way to put it. It was something I hope I never have to do again, but it’s a lasting memory. I’m on that road often when I’m in New Jersey, coming back, and I always look at Manhattan at the exact same point that I looked at it in 2001, and the image lives on”, Valentine stated only days after the event. Valentine was the first Met to visit Ground Zero as he traveled down in a police cruiser that had alterations made to be able to carry down more supplies for first responders. When Bobby returned from the initial trip down he shared his experiences with the players and coaches. Valentine said, “It had me experience fear at a level that I had never experienced, It had me experience anger at a level I never experienced and it had me experience sadness, again, at a level that I never had before. And then there was the confusion of what to do. And everyone in New York and the surrounding area, and I think a lot of the country, had that same dilemma. Do we go down to the recruitment center and sign up? Do we lock ourselves in our house? Do we lend a helping hand to those in need?” Even with the mix of these emotions Bobby lead the charge as the Mets helped in the relief efforts any way they could. Mets cleared debris and helped those in the surrounding area victimized by the tragedy. John Franco the Mets closer was quoted, “Bobby was a great leader, He had us out there, and even when we were done, he stood out there by himself helping everybody else, all the volunteers. It wasn’t something we were ordered to do, either. We wanted to do it, we wanted to help, and once a couple of us got the OK to go downtown, we went downtown — Bobby, John Stearns, myself, Al Leiter, Robin Ventura, Mike Piazza, Todd Zeile. We wanted to go down there just to thank the workers.” This lead to an unforgettable scene as the Mets and the first-responders exchanged hats and those hats served as symbol for the Mets who would go on and wear them the rest of the season. Valentine’s relief efforts much like the first responders did not end on that day. As the Mets returned to action on the seventeenth, the restoration continued. Bobby reminisces on the days saying, “It was remarkable the way they were met, the workers there were working on fumes, going around the clock, and we know how desperate it was and how impossible it was, what they were trying to achieve.” Bobby would continue to give in anyway he could including adopting a family which he would help sparing no effort. Bobby took the Conroys in as if they were his own. This is the man who we are fortunate enough to work for, the kind of person who will help you in whatever you need and never ask for a favor in return. He has an impulse to give as much as he can and continue to give without any expectation of a return. The horrific events only inspired him to give more and we should all use that as a reminder to do for others because it is the right thing to do. Bobby continues to lead by example through both the darkest and brightest of times. It is important to be thankful for his efforts and those of all the first responders who controlled their emotions and helped rebuild following the events back on 9/11. There is a 90 minute special on ESPN tonight covering The Comeback Season at 7pm. Bobby highly recommends that everybody check this out if they can! Cornelius(Cory) Johnson is going into his senior year at Brunswick high school and is breaking records and catching the eyes of college coaches all around the country. He started at Brunswick school in 6th grade and when he got to the high school, started as a freshman on their football team immediately. 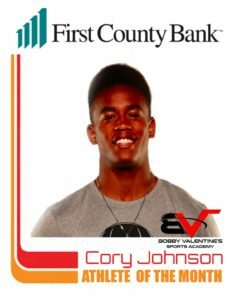 Cory is the second in his family to play competitive football following an older brother at the University of San Diego. Cory plays the wide receiver weighing in at about 197 and stands about 6’2.5”. He began training with Overdrive Elite 3 years ago and while working with Overdrive, Cory tested his 40 yard dash ending with a 4.5 second and also his shuttle in 4.1 seconds. These numbers resembling those of NFL receivers, Cory’s offers and achievements reflect heavily upon these results. As Cory’s football career has progressed he continues to win awards and nominations for outstanding talent. His sophomore and junior season he was named all conference. Cory stood as captain in his junior year and made the All-New England team his junior year as well. Following his junior season, Cory received a 4 star rating on ESPN and was a finalist for Nike’s The Opening. He is on the path to break Brunswick records in the number of touchdowns and yardage in the history of the school. Cory’s hard work and efforts have definitely paid off for his dream of playing college football and then onto professionally. He received his first offer in 2017 by Duke University. Following Duke, Cory has received what seems like endless offers from all top football schools. Cory was offered by 2017-2018’s champion team Alabama this year amongst many big name schools; Stanford, Michigan, Notre Dame, Boston College, Penn State, etc. Cory is unaware when and who he is going to commit to at the moment. His favorite professional team is the Los Angeles Chargers and his current favorite player is Jarvis Landray. Our third Athlete of the Month goest to 14 year old, Kim Saunders from Stamford. She just finished her freshman year at Stamford High school. During her freshman year she played both volleyball and softball. Kim was on their varsity softball team this past season as a pitcher and third baseman playing in nearly every game. She threw a perfect game in their win against Staples. By the end of her freshman season Kim had hit 6 home runs as well. Kim was awarded 2nd Team all FCIAC as a freshman. Kim started playing softball about 6 years ago and has been training with B.V.S.A Coach Danielle Simoneau for 5 years. Kim hopes to go on and play college softball after she graduates high school. Her dream schools are Texas A&M where her father attended college. Other schools she is interested in include The University of Rhode Island and The University of Virginia. Kim helps other kids improve their game too at the B.V.S.A softball summer camp. Off the field Kim is very into her studies as well. She is in all honors classes making honor role each term at Stamford High School. Social Studies is her favorite subject. When Kim goes on to college, she thinks she will want to study business. Kim Saunders is a young star on and off the field and if she keeps up the hard work, she’ll be a very successful student-athlete. Jack, A.K.A “Jackie Boy Baseball” started coming to the Academy at age 5, when he told Frank he “wanted to be on the Furry (not Fury) team”. 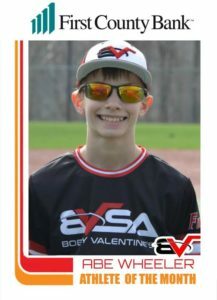 Jack made his first BVSA Fury team for the 10’s at age 8 and has played 10 consecutive seasons since, earning 4 team tournament championships along the way. 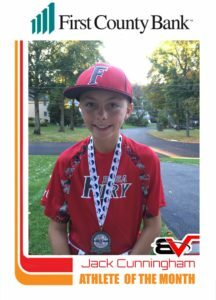 Jack is currently playing for three baseball teams this Spring; 13U Fury, 12U Darien Blue Hawks and for Masonic in the Darien Little League baseball program. In 2015 he was on the Darien Little League Championship, Team Merrill Lynch, has played in 2 All-Star games and most recently was on the 11U Connecticut Little League District 1 championship team in 2017, finishing the Districts season with,17 hits, 4 doubles, 4 home runs, 11 runs scored, 11 RBIs, batting .567 with an OBP of .581 and slugging 1.1 over the 8 game tournament. He finished the 2017 season with 21 career over-the-wall home runs. Off the field, Jack is a 7th grader at Middlesex Middle School on Darien and is a lifelong Mets, Jets and Islanders fan. He and his younger brother Colin are licensed State of Connecticut boat captains. In 2015, Jack was able to take batting practice at Citi-Field with the Mets and got to announce the starting lineup on the Stadium Scoreboard and on national TV. Our first Athlete of the Month goes to our very own Abe Wheeler. Abe’s story and work ethic are inspiring. Last fall Abe was losing weight and suffering from intense stomach pain. He was missing a lot of school and really lagging in football. He made many visits to doctors and specialists trying to find out the cause. He underwent countless tests and procedures. He tried multiple medications and dietary restrictions with complicated regimens – all of which he adhered to with great self-discipline. Nothing worked. In January, after a series of remarkable events, he was tested for a condition called MALS – Median Arcuate Ligament Syndrome. On March 1st he tested positive and underwent a serious open abdominal surgery. The surgery was performed by the leading MALS specialist in the country who is miraculously based in Fairfield, CT. Abe rallied and blew all the nurses and doctors away at his speedy recovery. He spent only three of the six predicted nights in the hospital. He missed half the school time the doctors expected. As of today, he has gained back 7 of the 10 pounds he lost and is back to his energetic and fun-loving self! The more we learn about MALS, the more blessed we feel to have found it so quickly, to have had it successfully treated and to see his physical stamina returning way ahead of what was anticipated. Watching him slide face first on the ball diamond with zero inhibition this weekend reassured us he’s back!! Abe loves baseball and the boys/coaches he plays with. He has a carefree confidence at bat, and his timing and swagger are returning. He sports an impressive new “zipper” (scar) and he’s proud to show anyone who asks – or doesn’t ask for that matter. First County Bank along with Bobby Valentine and his team are excited to announce a new collaboration between First County Bank and the Bobby Valentine Sports Academy (BVSA). First County Bank is now the official field sponsor of BVSA’s new 40,000 square foot indoor sports facility. BVSA has been in Stamford for over 12 years and recently moved into its new facility located at 4 Largo Drive in Stamford, CT. The new BVSA building boasts 40 foot ceilings, a 15,000 square foot turf field, two multi-surface areas and six batting cages. On any given day, you can observe one-on-one baseball and softball instruction, team practice on the full field, lacrosse skill training and IQ development, soccer team/small group training, football practice for local high schools and even large scale community events that can host over 800 guests. “First County Bank has been servicing our community since 1851. They have a personalized approach to customer service as does BVSA. We believe when you find a partner that treats others the same way you do, it makes for a great like-minded relationship,” said Bobby Valentine. “I am thrilled with our partnership with First County Bank. Teaming up with such a great local banking institution is an honor.” Mr. Valentine is a Stamford native and has been a First County Bank customer for most of his life.